I know that Spring is coming but I can’t help but keep falling in love with fall veggies and flavors over and over again. I’m not even mad about it, in fact, I’m very much okay with that. I love eating what is seasonal and available locally, but sometimes you just crave sweet potatoes and black beans. Anyway, it’s been a while, too long if you ask me, since I’ve written. Life again had caught up with me and bogged me and my free time down, making me unable to update the blog. But I’m back again! I’ve been trying out this new thing where I don’t eat carbs for dinner (or dessert) during the work week. I want to get in the habit of using those as fuel for my day and incorporating them into breakfast and lunch but just not for dinner. The coupled with exercise has been leaving me feeling pretty wonderful, getting good sleep and not waking up hungry or bloated. Carbs are one of the best sources for fuel in our bodies so you don’t really need them around dinnertime or late in the day because soon you’ll be headed to bed and your body won’t have enough time to convert them into expendable energy, as your body is shutting down. Sidebar: I’ve also been replacing sweets and desserts with fruit. This is the perfect time of year to do so since so many fruits are coming back into season lending the sweetest, ripest, most flavorful fruit. I do this with the occasional exception of half of a Lenny and Larry’s vegan cookie, because sometimes there’s a cookie shaped hole in you that needs to be filled. As I am typing this out I’m eating my daily fruit of pineapple with my organic green tea. So with this new parameter around dinner I’m generally left with a lean protein (because I exercise in the evenings and I need that protein!) and veggies. It’s one of my favorite pairings and there’s so much versatility! The combinations are virtually limitless. This week I wanted something spicy with a latin flavor. Luckily I live in Texas so there’s no shortage of delicious ingredients to work with when it comes to those flavors! Mole is just a dark sauce originating in Mexico that generally has cocoa in it. I love cocoa and I love this dish. I use this dish for meal planning so I divide the cooked chicken between four containers and the veggies between those same 4 containers. 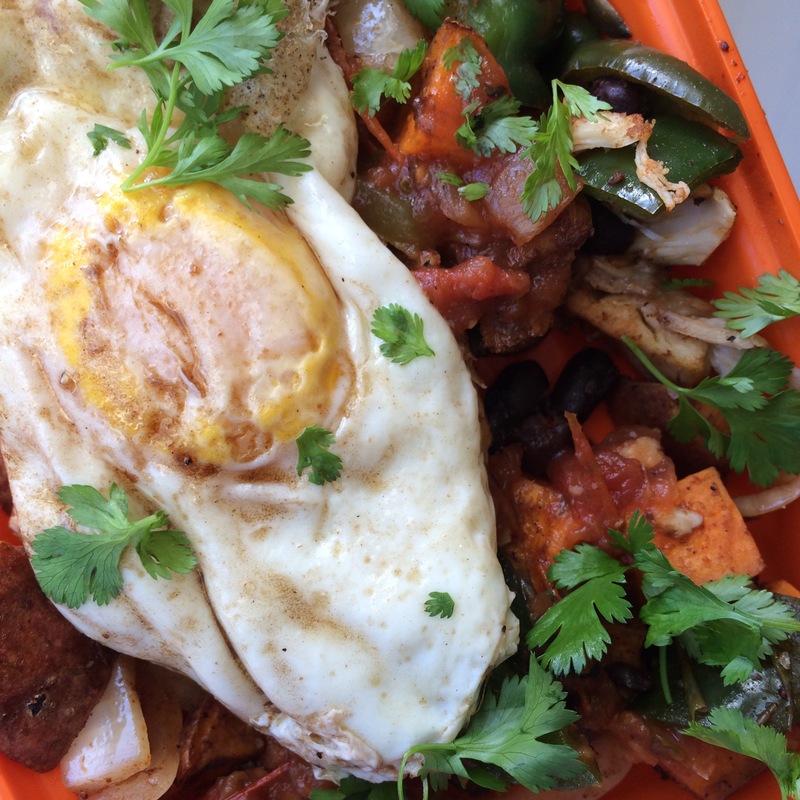 *optional toppings for serving: diced avocado, fresh cilantro, salsa, or a fried egg. Place chicken and sauce in a small baking dish in a single layer. Wrap tightly with two layers of foil until it is completely sealed all the way around. Bake in the oven for 1 and a half hours (90 minutes). This will allow the chicken to cook slowly and steam inside the dish. Set aside to cool. While the chicken is cooking, toss the cubed sweet potato in the olive oil. Add the smoked paprika, cinnamon, cayenne pepper, salt and fresh cracked black pepper. Mix well. Spread onto a lined baking tray into a single layer and bake for 20 minutes at 400 degrees or until slightly tender. You don’t want to overcook them and make them mushy. Set aside. While the sweet potatoes are cooking, heat a skillet over medium heat. Add the remaining 1 tablespoon of extra virgin olive oil. Add the sliced yellow onion and add the cumin and chili powder. Sauté until barely translucent, stirring occasionally. Once the onions just start to get tender, add the black beans, garlic and roasted poblano pepper. Stir well to incorporate. Taste and add salt as needed or to your desired taste, just don’t get too heavy handed with the sodium. Remove from heat and set aside. Top with the pepitas. Once the chicken is cool, cut into large cubes. Serve immediately with the veggies on the side. It will be extremely juicy and tender from the slow, moist cooking. The mole pairs perfectly with those Mexican flavors in the veggies. Optional: For more protein, top with a fried egg. That runny yolk goes perfectly with the veggies. That’s what I do on days I need more protein, like weight days in the gym. Also, tastes delicious topped with fresh cilantro leaves, salsa and diced avocado. Don’t be afraid to try new foods, new flavors or new “diets” in your life. Get creative with your toppings and veggies. There so many delicious flavor combinations out there. I ate on this dish for a week with absolutely no complaints and felt fully satisfied each time.